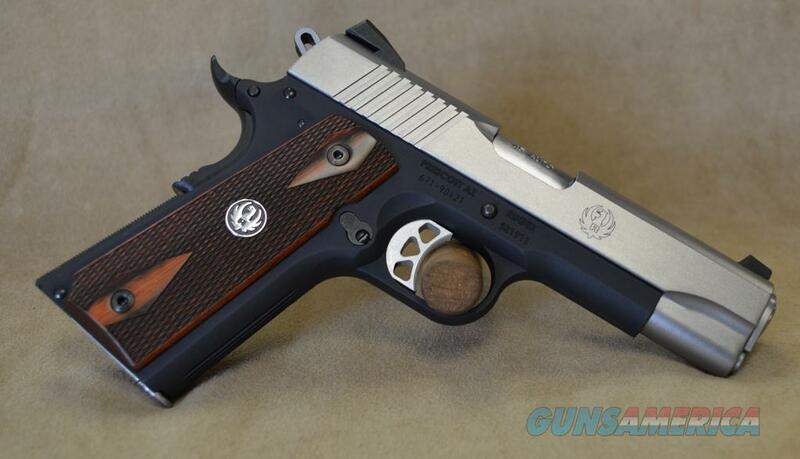 Description: Ruger Sr1911 Lightweight Commander in 45 ACP Caliber. Factory New in Box. 7+1 capacity. 2 magazines included. Anodized aluminum grip frame. Stainless Steel (Low-Flare) Slide. Drift adjustable 3-dot novak sights. 4.25" barrel. Not approved for sale in MA or CA. Features: Classic, original 1911 Series 70 design. Lightweight, anodized aluminum frame. Polished titanium feed ramp. Precision CNC-controlled machining process results in a superior slide-to-frame fit and smooth slide travel. The stainless steel barrel and bushing are produced from the same bar stock, on the same machine, for improved accuracy. Positive barrel lock-up allows for superior accuracy out of the box. Oversized ejection port and extended magazine release enhance competition performance. Thin hardwood grip panels, checkered backstrap and front strap serrations. Lightweight, aluminum, skeletonized trigger features an adjustable over-travel stop and provides a very crisp, no creep, light trigger pull with a quick, positive reset. Skeletonized hammer is lightweight and provides faster cycling. Dovetailed, high-visibility 3-dot sight system features a Novak® LoMount Carry, windage adjustable rear and standard front sights that combine optimal target acquisition and an ideal carry configuration. Oversized beavertail grip safety provides positive function and reliability. Extended thumb safety and slide stop lever for improved, positive manipulation. Integral plunger tube for slide stop and thumb safety is not staked and will never come loose. Features a standard recoil guide system and flat mainspring housing. Visual inspection port allows for visual confirmation of a loaded or empty chamber. Rear slide serrations allow for positive grip. Accepts all standard, aftermarket 1911 parts and accessories. Also Includes: swaged link pin; titanium firing pin; two stainless steel magazines; bushing wrench; soft case.